One of the really cool things about living in a major city like Los Angeles is that you can get experiences that are unavailable anywhere else. Today, the very last space shuttle external fuel tank is being moved from a barge in Marina Del Ray to its final resting place at the California Science Center. I took the opportunity to drive down to Inglewood to take a few pictures. Memories of past American space program glories almost brought tears to my eyes. Once at the museum, it will be rejoined with one of four existing space shuttles in the country, the Endeavor. Eventually, the display will look like this for kids too young to know what the space shuttle looked like. 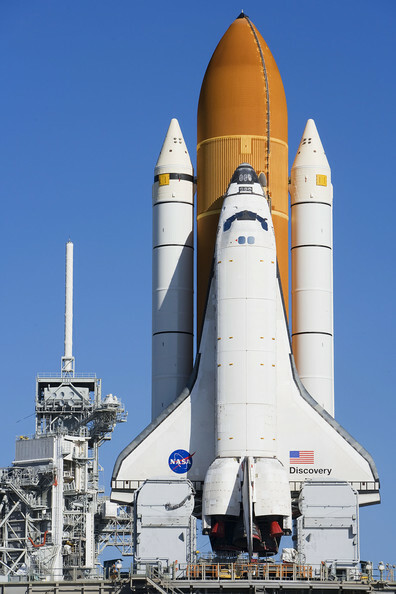 This will be the only place in the whole world where one can see the entire space shuttle launch configuration intact. Gosh it's good to live in LA. When the space shuttle was introduced, it was going to make access to space cheap, safe, and easy. Weekly launches were predicted. Now we have to pay the Soviets 50+ million to transport our astronauts to the International Space Station. There should have been a more fulfilling end to the shuttle program. It is really cool to witness the transport of huge historic items. I will always remember seeing the German WWII submarine, the U505, cross Lake Shore Drive in Chicago on it's way from Lake Michigan to the Museum of Science and Industry.